Salesfusion is transforming how mid-market businesses engage audiences and measure marketing success. Our marketing automation platform is purpose-built for mid-sized companies. It is designed to include all of the features you need in a single platform that is both broad and deep in capability. We obsessed about the platform design to ensure it is easy to use with drag and drop interfaces for email, landing page, and form builders, and Salesfusion is the only marketing automation platform to include a comprehensive Business Intelligence module. 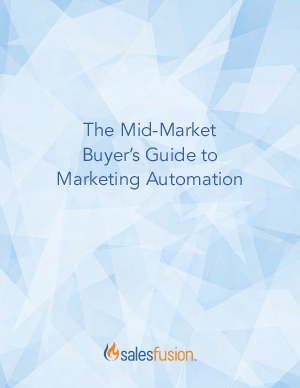 Are you ready to amplify your marketing efforts and dive head first into marketing automation with Salesfusion?